A few good books on the subject of medieval women . . .
Pilgrimage was an available form of religious devotion for many, and had a complicated and illuminating relationship to women’s culturally accepted roles. Independent women, unregulated by patriarchal institutions, fashioning their own communities around work and spiritual practice . . . might the medieval beguines be a kind of prototype for Elizabeth Schüssler-Fiorenza’s ekklesia of women? Beguines were lay women who banded together to lead a more devotedly religious life, without entering a cloister. Reasons for choosing the beguine life differed; some women were widows with children, who would have had to abandon their children to enter a cloister; others lacked the money with which to secure a position in a convent; others felt they lacked the temperament for cloistered life. Some women entered the beguine life in an effort to escape undesirable arranged marriages, or abusive marriages — beguines were known to have helped women in these circumstances. Whatever the motivation, the life of a beguine allowed a creative articulation of the contemplative and the active life in a flexible way that suited the lives of lay women. Beguines took vows — of chastity, and of obedience to the head of the beguinage — and engaged in religious practices of contemplation and service. They did not take vows of celibacy, and were free to leave the life to marry or remarry. They did not take vows of poverty, and were expected to provide for their own welfare by their own work. Since the beguines never had official ecclesial status, their vows were not recognized by the church in the same way as those of other religious; but this meant a beguine’s career could be as permanent or temporary as she chose. Some beguines left the life to marry; others moved on to even more rigorous religious observance; Yvette de Huy, for instance, ended her life as an anchoress. Beguines’ status in the eyes of official Christendom was precarious at best. Their “vernacular theology,” lay writings, appropriations of Scripture into local languages, and teaching activities (which sometimes seemed to amount to actual preaching, an activity reserved for men) were suspect. The name “beguine” itself was a pejorative, associated with the [heretical] Albigensians or with mumbling speech, that is, speech not to be trusted. The doctors of the church labeled beguine theology “irrational” and church leaders accused the beguines of “false piety.” Ecclesiastical authorities tolerated the movement for about 100 years, then turned towards persecution after the prominent beguine Marguerite of Porete, author of The Mirror of Simple Souls, was condemned and executed as a heretic. Decrees from the Council of Vienne, 1311-1312, also targeted the beguines. In spite of everything, small beguinages persisted well into the 20th century — perhaps attesting to the attractiveness of a way of life that was architected by women, around the realities of women’s lives, and oriented towards the Ultimate Good. That sounds a lot like what might come under the banner of the ekklesia of women after all. Virginia Woolf, in 1928, noted that a woman needed “money and a room of her own” to write fiction. The medieval anchoress, (one of the five religious options available to religiously-minded women of the middle ages) may confirm Woolf’s insight. The anchoress secured both money and a room of her own, not for the writing of fiction but for the religious life of contemplation and study. An anchoress took upon herself a vow to remain in one place — the anchorhold, typically a small enclosed structure attached to a church — for the remainder of her life. This anchoritic practice was not new, being in fact one of the oldest forms of monasticism, but it flourished during the middle ages. lived out in a single small cell; anchorholds might have several rooms, and might include gardens. Animals other than a single cat were, however, discouraged. Moreover, while an anchoress was not expected to live lavishly, she would not have been destitute. Most anchoresses seem to have come from the upper middle or middle classes of medieval society. Before entering the anchorhold, an anchoress would typically have made arrangements for the provision of her needs, either through her own endowment, or through the sponsorship of a local patron — who might find the merit associated with this charitable deed attractive. In short, anchoresses did not just have the rooms of their own, but also the money, to live lives devoted to contemplation, rather than ones taken up by the daily demands of a household, husband and children. Most anchoresses were somewhat anonymous, like the 12th century anchorite and poet known simply as Ava, though they conferred prestige on the communities of which they were a part, and would have been significant local presences. Some, however, were well and widely known. Perhaps the most famous of these medieval anchoresses is the 14th century mystic Julian of Norwich, who authored her magisterial Sixteen Revelations of Divine Love after taking up the anchoritic life. Sixteen Revelations of Divine Love, while not a work of fiction, is the first book in English written by a woman. When people in the United States think of “the Middle Ages,” chances are they think of Europe. But people lived everywhere on the globe during the centuries thought of as medieval (roughly the 5th to the 15th centuries CE). In Ethiopia, the fortunes of the Christian Aksumite Empire, and its successor Zagwe dynasty, intersected with the lives of two remarkable women — about whom almost nothing seems to be known with certainty. History knows that in the late 10th century CE a woman warrior, Godit (alternatively, Yodit, Gudit, Judith, or colloquially Isat), led the raids on the forces of the waning Aksumite Empire that brought it to a definitive end. One source identifies her as the founder of the Zagwe dynasty. It is clear that she was not Christian; some sources suggest she may have had ties to the ancient Falasha, or Jewish, Ethiopian community; what is unclear is whether her opposition to the Aksumites stemmed from this religious difference, or had some other origin. Over time, however, the Zagwe dynasty returned to Christianity. 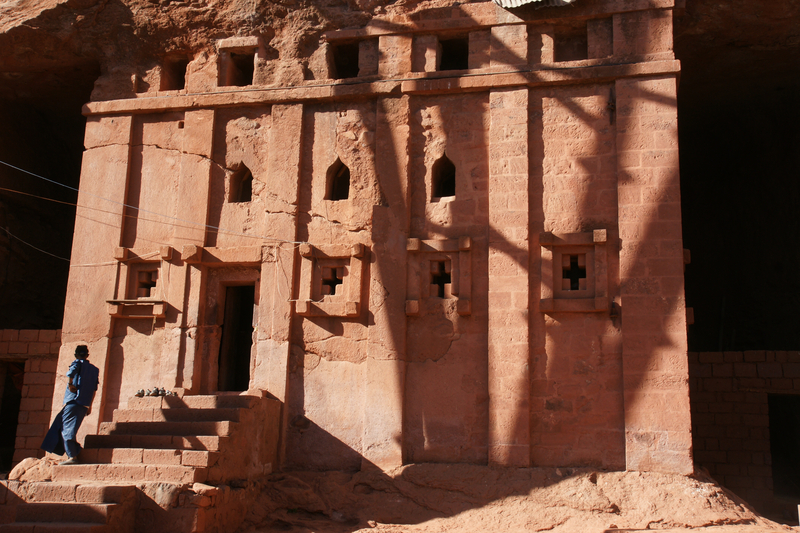 Late in the Zagwe period, in the last years of the 12th century and the first years of the 13th century, the ruler Gebre-Masqal and wife Masqal-Kabra undertook a massive architectural project that now ranks as one of the wonders of the world: the rock-hewn churches of Adefa (later known as Lalibela, after one of the epithets of the king). Masqal-Kabra reportedly exerted sufficient political influence to have had her brother Hirun ordained as bishop (a canonical source documents an ecclesiastical dispute over alleging the bishop’s bad behavior, which proved false; the pious bishop never left his hous except to perform mass), and to have persuaded her husband to abdicate for a time in favor of his nephew Naakweto La-ab, and then, after reports of gross injustice in Naakweto’s administration (soldiers reportedly appropriated a poor farmer’s only cow) to have insisted that Gebre-Masqal take up the crown once more. She is also reportedly the sole patron of one of the rock-hewn churches, Bet Abba Libanos, said to have been built as a memorial to her husband after his death in 1230 CE. Attestations in every case are less secure than sometimes reported — which may be one of the central lessons these remarkable women have to teach. 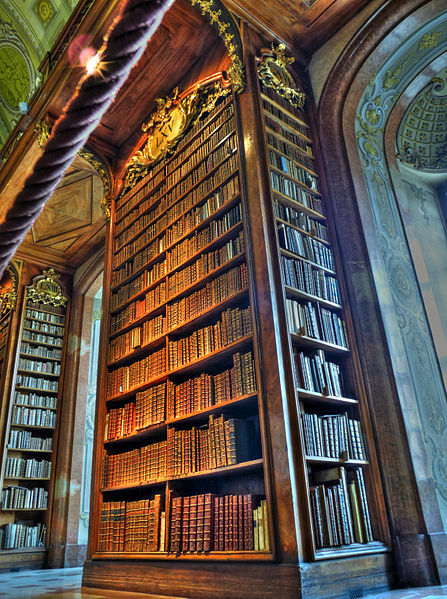 History is not just a process of memory, but of valued and protected memory. It preserves best what power chooses to remember, and what tenacity refuses to let go. That process has not been particularly kind to women, nor even — despite tenacious efforts by a long-lived dynastic leadership — to Ethiopia. A genuine celebration of diversity includes the celebration of memory . . . the insight behind Women’s History Month. In J.M. Harden’s 1926 Introduction to Ethiopian Christian Literature on Masqal-Kabra, as part of an excerpt from the Life of King Lalibela. The world-historical break-up of the Roman Empire in the west inaugurated a period of struggle for power and control of the former imperial territories. That world history involved women. The life of Radegund (b. ca. 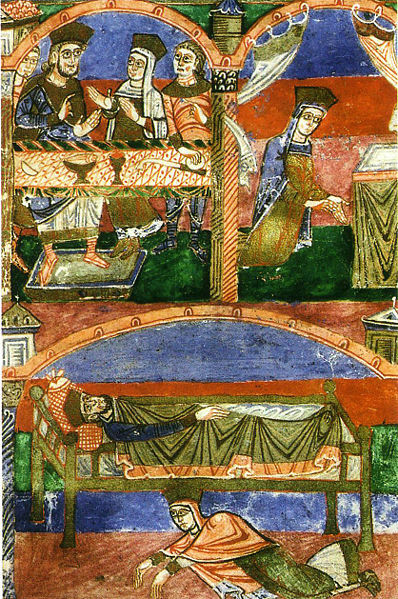 520, d. August 13, 587) — Queen of the Franks, Saint of the Church — dramatizes the intricate relationships that formed between European leaders of the early medieval period and the church representatives whose approval they sought. It also dramatizes the human side of the political and military struggles taking place during this period. Radegund was the daughter of a king of Thuringia (what would today be an area of central Germany). Her uncle killed her father in a battle for territorial control when she was very young. In 531, Clotaire I, King of the Franks, invaded Thuringia, killed most of her remaining relatives, and took her and her brother, Hermanfried, back to his stronghold in what is now Picardy. This abduction meant exposure to Christianity; the Franks had been at least officially a Christian people since Clovis I’s conversion to Christianity in 496. Just how much support can be gleaned from the following facts: Radegund founded the Convent of Our Lady of Poitiers, later the Convent of the Holy Cross, ca. 552, with lands and money from her own inheritance, and with the blessing and active assistance of Clotaire. The convent grew to a community of about 200 nuns. Its organization under the strict Caesarian rule, which stipulated the education of the sisters and their devotion of part of the day to sacred reading, as well as a strict confindement to the cloister, seems to have been part of her efforts to remain free of the control of Maroveus, the Bishop of Poitiers. Some time ago, when I found myself freed from earthly cares, with Divine Providence and with God’s grace to inspire me, I turned of my own volition, under Christ’s guidance, to the religious life. I asked myself, with all the ardor of which I am capable, how I could best forward the cause of other women, and how, if our Lord so willed, my own personal desires might be of advantage to my sisters.